Today I am a lucky person to have dog in my house and of course to help a dog outside my house. But this actually was not easy. One day in December 2009 we went to a breeder who led us to a kennel where many Labs were kept. But there was only one pup who was the fastest and cutest. He came to check who was standing, that was love at first sight. We named him Blog and called him lovingly Bloggy! I had to face difficulties as my father was not receptive to dogs. However, surprisingly after a few months he started pampering and even taking him to walks. After a few months, a cute brown little stray came near my house. I first thought she just came in search of food but she started living there. Since that day whenever I used to go to cycling I would hide some biscuits in my pocket to feed her. Biscuits were unbelievably getting finished. This happened regularly for two months. I was just 10 years old then. One-day my mother noticed what I was doing and she too joined the gang! We started feeding her secretly by hiding it from others in the house. When my father got to know about it he was angry at first but allowed later. She fell ill because she ate bones thrown out by butchers and her mouth got infected by cuts. Now-a-day we not only feed her but also give her medical treatment. She is loyal and protective. She sleeps in the day and guards the colony at night. I think my mother Shuchi Arora is the best pet lover I know, she everyday takes care of our stray friend who has been around us for nearly two years now and has done a lot for our colony. http://www.dogsandpupsmagazine.com/wp-content/uploads/2013/05/My-mom-and-me-2.jpg 161 300 Dogs and pups Magazine http://www.dogsandpupsmagazine.com/wp-content/uploads/2017/05/1254nal.jpg Dogs and pups Magazine2013-05-18 18:25:362013-12-12 17:37:10My mom and me! Is your dog expecting or are you waiting for your new puppy to arrive? If so, Royal Canin has developed its Birth & Growth nutritional solutions, specially formulated to make the critical period from birth to weaning safe for your dog and her puppies. 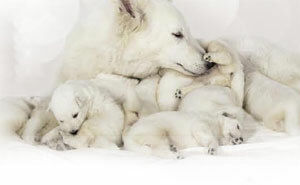 In dogs, gestation lasts around nine weeks on an average. In the first six weeks, the mother’s energy needs are not that high. However, in the last third of her pregnancy, foetal development speeds up dramatically, and her nutritional needs change; this is when she needs a food with much higher energy, protein and mineral levels – but at the same time ingestive capacities decrease. At this stage, she needs to move to Royal Canin’s Starter, a very digestible energy-dense food. A couple of weeks before the due date, move her to a quiet place, and make sure you have everything you might need ready. By the time of delivery, she should not have gained too much extra weight (around 25 percent above her ideal weight is fine) so that the delivery itself is not too much of a strain. After delivery, feed her Starter ad lib until weaning. From the first hours of life, the puppies will suckle from their mother who will produce up to three times her own weight in milk over the next 6 to 7 weeks. Her milk is very rich in proteins and fats and to produce it, the mother draws reserves from her own diet. Starter provides the lactating dog with the energy and protein she needs, along with necessary nutrients such as calcium and essential fatty acids. Weaning starts naturally at around four weeks. The puppies’ digestive capacities have developed, the first milk teeth have come through, and milk alone no longer completely fulfills their increasing energy needs. Start off with a ‘porridge’ of Starter, and then gradually reduce the quantity of water or milk replacer until you are just feeding dry food–this is the ideal transition to solid foods. Around two months of age, a puppy’s growth speeds up and a large-size puppy can have his weight multiplied by 70 within 15 month! Such a quick development requires to provide puppies with a well-balanced formula so that their optimal growth is ensured within the risk of putting on any extra weight. During that period, puppies’ digestive system remains immature and their natural defences are still building up, which is why a smooth transition towards the ‘Junior’ food specifically tailored according to the puppy’s size or breed is necessary. I had unstained, unfired clothes.